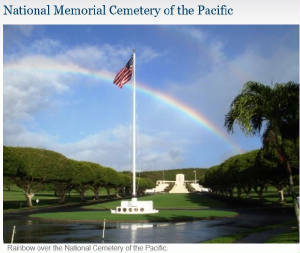 Few national cemeteries can compete with the dramatic natural setting of the National Memorial Cemetery of the Pacific. The “Punchbowl” was formed some 75,000 to 100,000 years ago during the Honolulu period of secondary volcanic activity. A crater resulted from the ejection of hot lava through cracks in the old coral reefs which, at the time, extended to the foot of the Koolau Mountain Range. Jack's name was added to wall F of this monument during the time he was listed as Missing in Action. Below is a picture of his name on the wall. In 1991, as the 50th anniversary of the Japanese 7 December 1941 attack on Pearl Harbor approached, Gen. Jimmie Adams approved a project to put historical photos and story boards in the foyer of PACAF Headquarters. That move could be considered the beginning of the Courtyard of Heroes. 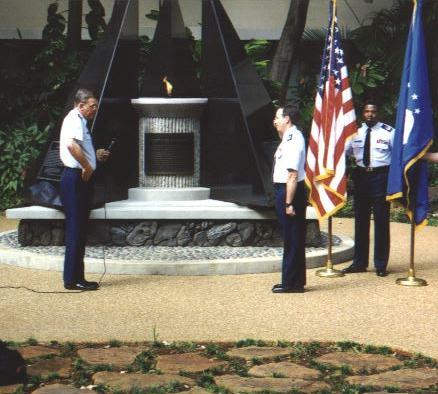 Another 50th anniversary -- that of the activation of PACAF's predecessor, the Far East Air Forces, in 1944 - was the impetus for the construction of the PACAF "In Defense of the Nation" memorial in the foyer in 1994. Listed on the memorial are the campaigns and some of the humanitarian efforts that PACAF subordinate units supported. 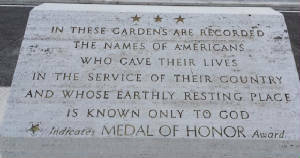 The Wall of Valor in honor of PACAF Medal of Honor recipients was also added in 1994. The largest part of the Courtyard of Heroes project was the landscaping of the courtyard itself and the erection of the large memorial with its "eternal flame." This was undertaken during command of Gen. John Lorber in 1995. General Lorber provided a vision for the entire project, which extensively involved base and headquarters civil engineers and historians. The project was managed by the Saber Element of 15 Civil Engineering Squadron. The project was accepted and finalized on 23 Aug 95, and the garden was dedicated on the 50th anniversary of V-J day. 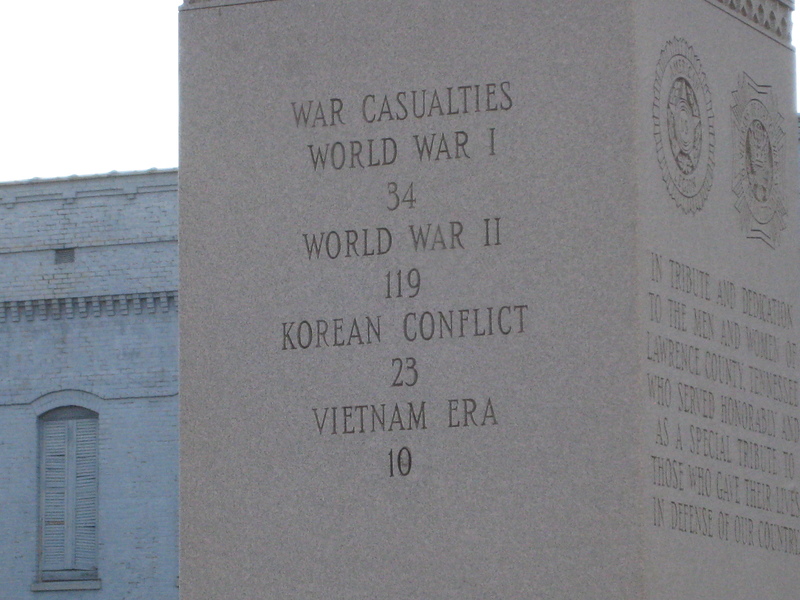 The large granite monument with the "eternal flame" in the center were designed to memorialize those men and women who lost their lives in the three wars in the Pacific - World War II, Korea and Vietnam. Two smaller monuments in the courtyard are memorials to those who lost their lives in this building and on Hickam Field during the 1941 attack. Click here to go to the official Virtual Wall page for Jack. 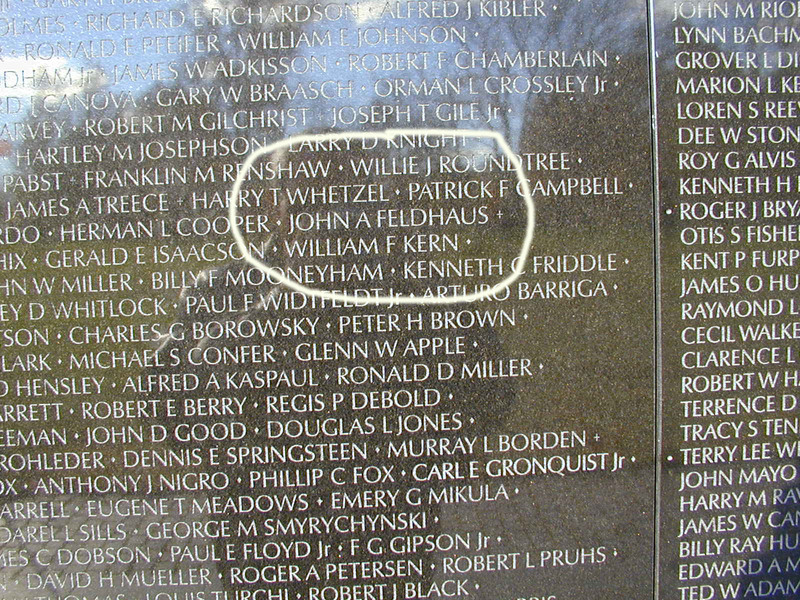 Click here to go to a list of names on the wall from the state of Tennessee. Click here to go to the Virtual Wall Memorial web site to look up someone listed on the wall. 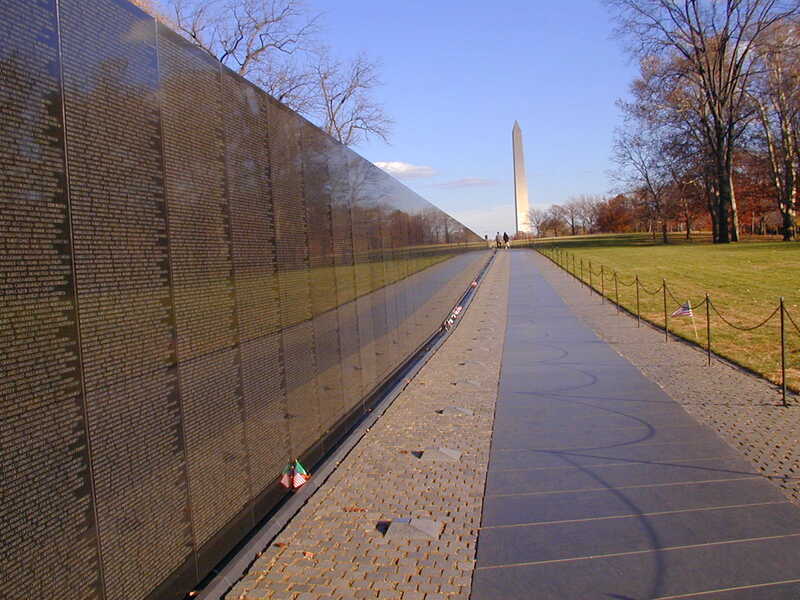 Click here to go to The Wall, another web site about the Vietnam Veterans Memorial Wall. This is the Vietnam Veteran's Memorial located in the Legislative Plaza in Nashville Tennessee. Also included is a wall of names of those from Tennessee who died in this conflict. 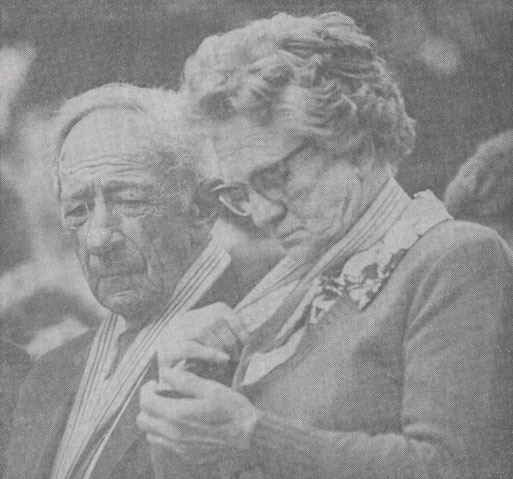 Jack's Dad, Lawrence Feldhaus, after receiving a medal in memory of Jack at the ceremony to open the Tennessee Vietnam Veteran's Memorial on November 10, 1985. Seated along side is Golda Henderson of McMinnville, one of the forty four relatives who received medals that day. Jack's Dad passed away two years later at 80 years of age. Click here to read the Joint Resolution by the Tennessee Legislature concerning Jack. 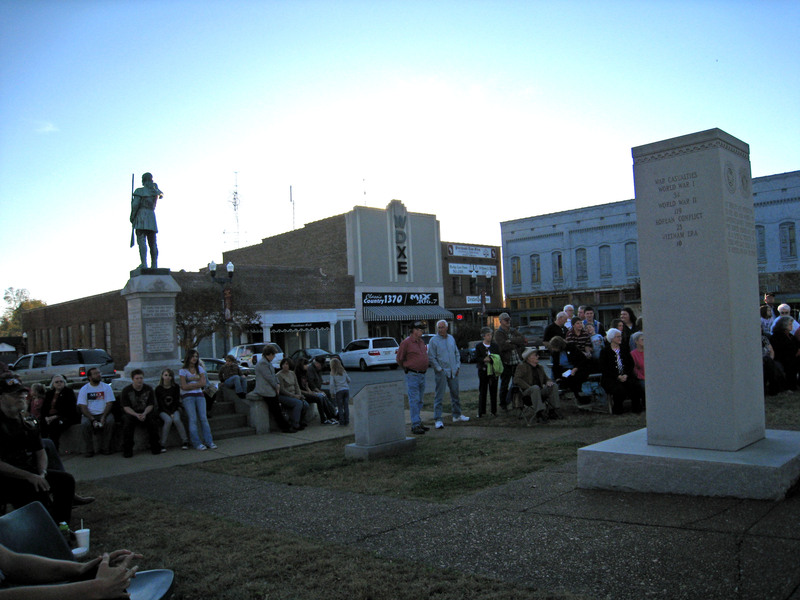 On November 9, 2010 I attended a Vietnam Veteran's Memorial Service on the Lawrenceburg, TN square. The service honored the ten Vietnam Veterans from Lawrence County who had given their lives in that war, one of which was my brother Jack. 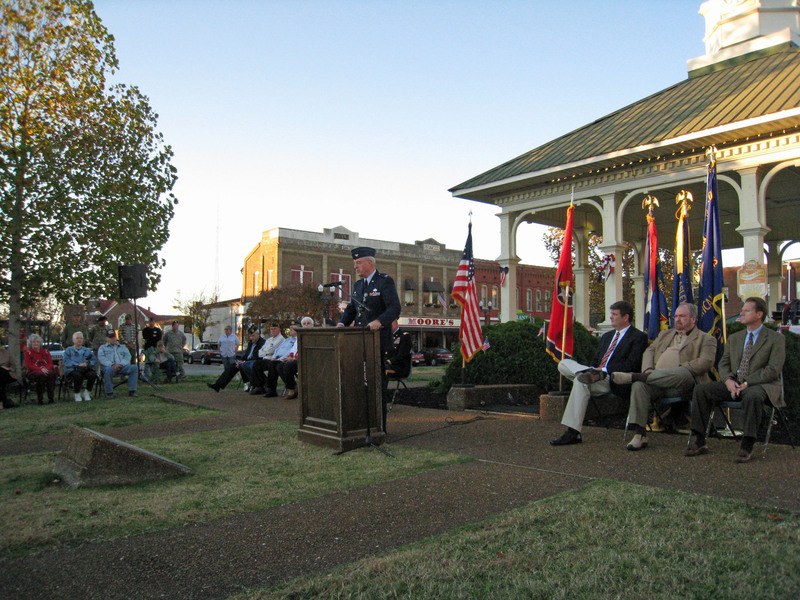 The service was organized by Col Hudd Moore who served two tours of duty in Iraq. 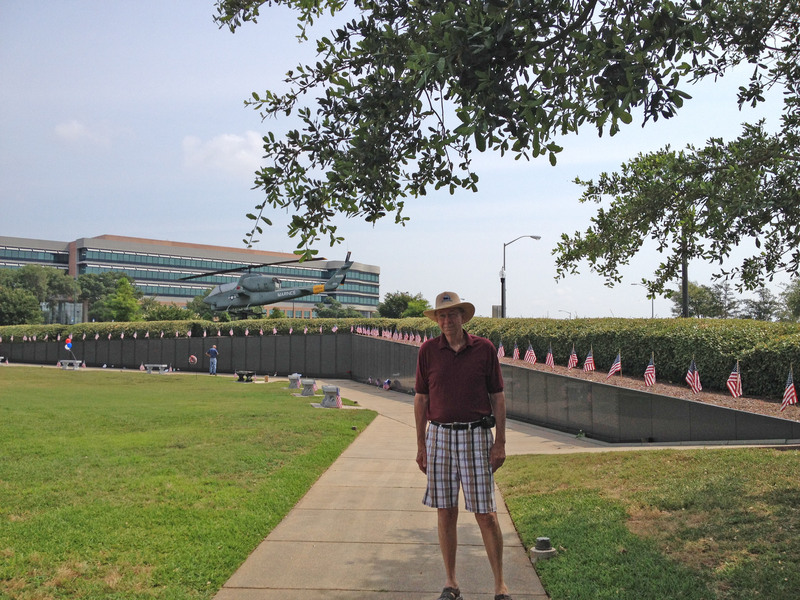 The Vietnam Veteran's Wall South is located in downtown Pensacola Florida near where Jack went through Navy flight training. My wife Janice and I were there for Memorial Day in 2014. She took the picture below of me standing in front of the wall. The names on the wall are located somewhat differently from the Wall in Washington Dc. Jack name appears on this wall on panel 6S, line 69.